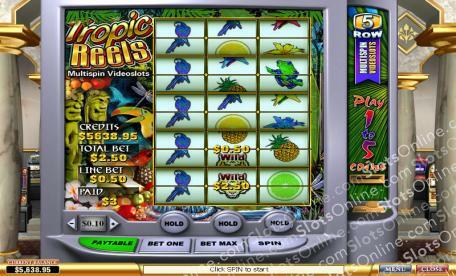 Experience the exotic wonders of a tropical jungle in the Tropic Reels slots. Click here to play! Appreciate Nature's Bounty in all its glory, and take a shot at claiming the casino's bounty at the same time. Pineapples are plentiful in this jungle, as are many other exotic fruits. Jungle oranges, limes and lemons provide sustenance to the animals that inhabit the jungle of the Tropic Reels. From tree frogs to toucans and many other colorful birds, prepare to marvel at the dazzling beauty of the wildlife in the Tropic Reels slots. The bravest adventurers can expect the greatest rewards. When three wild tigers are lined up, those who have risked the most can reap the reward of 2500 times their line bet. Chasing tigers is not for the faint-hearted, though, so it is a rare jungle explorer indeed who can meet the challenge of the Tropic Reels and claim its treasures. Tiger symbols are wild and may substitute for all other symbols.